Reference number for this case: 29-Oct-54-Reichstett. Thank you for including this reference number in any correspondence with me regarding this case. The Alsatian journalist Christian Valentin, who is interested in UFOs, in his file on 1954 saucer flap in Alsace published in the magazine "Saisons d'Alsace" in the Summer of 2004, that on October 29, 1954 at 07:50 p.m., two brothers on a motorcycle on the road from Reichstett to Hoerdt distinctly saw a bright cigar-shaped object that moving extremely fast from east to west. The tip of the cigar was white, the body cast alternately red and green lights, and behind it there was a long straight luminous trail. Four other people who were driving on the same road gave the same description of the phenomenon. The description makes me very strongly think that it was a meteor. Strasbourg. -- Two brothers, L and R N, from Koenigshoffen, came to alert our editorial staff last night, stating they had seen a strange craft, at 07:50 p.m. on the Reichstett-Hoerdt road, as they were heading by motorcycle towards the latter locality. For a few seconds the two brothers distinctly saw an object in the shape of a cigar moving extremely rapidly from east to west, at a height of about 500 m.
The curious cigar whose tip was white and whose body was throwing alternately red and green lights, left behind a trail of light in the shape of a stick. Four other witnesses who were on the same road at the same time, saw the strange craft with an identical appearance. Journalist Christian Valentin indicates that on October 29, 1954, at 07:50 p.m., two brothers who were circulating by motorbike on the road of Reichstett to Hoerdt distinctly saw a luminous object in the shape of a cigar, which moved with an extreme speed from the east towards the west. The point of the cigar was white, the body threw alternatively red and green gleams, and it had behind itself a long and straight luminous trail. Four other people who were driving by car on the same road made an identical description of the phenomenon. That forum copied the list of 1954 French sightings from my website, hence the mention of this sighting report, without indicating the source. Strasbourg. Two brothers, L. and R. N., from Koenigshoffen, came to alert our editorial staff last night, stating they had seen a strange craft, at 07:50 p.m. on the Reichstett-Hoerdt road, as they were heading by motorcycle towards the latter locality. Above: the road and landscape from Reichstett to Hoerdt en 2014. The distance between the two villages is about 6 km. 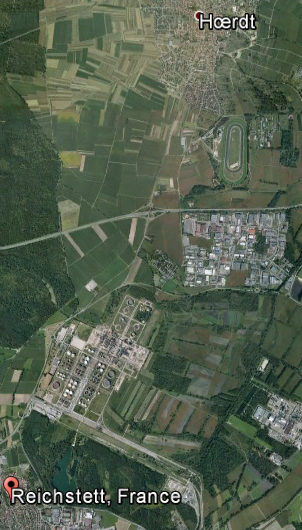 The place is just north of strasbourg. My astronomy software indicates it was night time during this observation there. 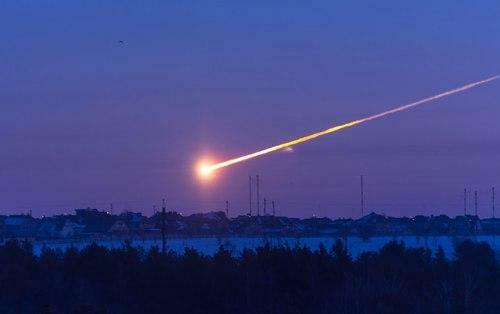 The description is an obvious description of a meteor. Nothing, as the information exists for now, would support the claim that it was not a meteor. [dn1] * "...Un cigare tricolore sur Hoerdt", article in the regional newspaper Dernières Nouvelles d'Alsace, Strasbourg French-speaking issue, October 30, 1954. [cv1] * "1954, l'Année des OVNIS - en Alsace et dans le Monde", dossier by Christian Valentin, in the quarterly magazine Saisons d'Alsace, Dernières Nouvelles d'Alsace publishers, France, #23, page 93, summer 2004. [cv2] * "Mythes et Réalités des Phénomènes Aériens Non Identifiés - Histoire des soucoupes volantes en Alsace jusqu'en 1980", book by Christian Valentin, Grimoires d'Alsace publishers, France, page 54, 2012. 0.1 Patrick Gross December 6, 2005 First published, [cv1]. 1.1 Patrick Gross October 30, 2011 A search on the web and in my documentation did not reveal other sources. 1.2 Patrick Gross February 15, 2014 A search on the web and in my documentation did not reveal other sources, except for [my1]. Addition of the Summary and of [my1]. 1.3 Patrick Gross May 2, 2015 Additions [dn1], [cv2].